The attractive peak of Edward can be seen from the Raspberry Flat car park in all its glory, over the top of Cascade Saddle. Like a lot of the peaks in this guide that aren’t named Aspiring, Mt Edward doesn’t see many ascents. The first ascent was made in 1914 by Bernard Head, Jack Clarke and Colin Ferrier, who climbed from the head of the Whitbourn. The first ascent from the Dart was by Russell Gordon, George Edwards and Doug Knowles, on March 7, 1935. From the Whitbourn Saddle, traverse or sidle under Maoriri. From below the Whitbourn Glacier climb a shingle slide to and then traverse the Geikie Glacier until able to descend a snow couloir from the saddle below Troas towards the Whitbourn. Climb through crevasses to reach an ice ridge about 60m below the summit. A variation is to cross the Whitbourn shoulder of Troas. Cross the Dart Glacier below the icefall to the scree slopes south of the East Ridge. These give access to the Marshall Glacier which is followed up to the base of a prominent rock face on the south side of the East Ridge about 200m below the peak. From this point the ridge is followed, with two chimneys and a short snow ridge before the summit. Alternatively the snow of the South Ridge can be reached by continuing to the top of the Marshall Glacier. 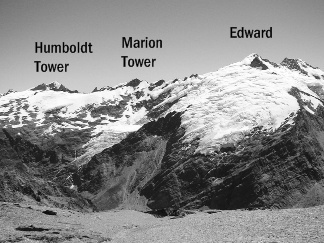 The climb would take six to seven hours from Cascade Saddle. Unfortunately no details of the route are available. The ridge can be gained by climbing the avalanche gully just south of the icefall and traversing a broad ledge (subject to avalanche early in the season) to reach the foot of the East Ridge immediately above the icefall. The lower section of the ridge appears to be the best rock and the most interesting climbing. Stafford Morse & Russell Fisher.